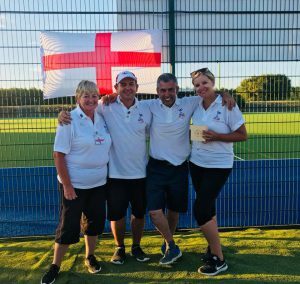 Last weekend (5th August) saw the members of our Whitnash Windmill Petanque section on the England team at the Home Nations Trophy held in Jersey. Carol Woodward, Glen Woodward and Hannah-Louise Griffin helped secure the win for England against Jersey, Scotland and Wales. 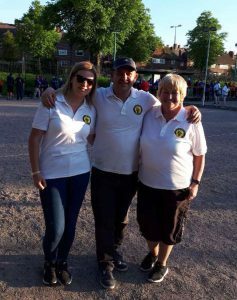 After qualifying earlier in the year to represent England in the Home Nations Tournament, three Whitnash Windmill Petanque players, Glen Woodward, Carol Woodward and Hannah Griffin, travelled to Jersey last weekend as part of the eight-triple England squad to compete against Scotland, Wales and Jersey. The Championship was held over Saturday and Sunday, each team playing six games on each day and at the end of day one, England were lying equal first with Jersey on 31 wins each with one match to finish the day. This match was the Whitnash team against a Jersey team, with Glen, Hannah and Carol playing some great petanque to beat the home team, putting England one game ahead of its nearest rival on day one. At the end of day one, Glen, Hannah and Carol had won five out of six of their games. Scotland were lying third on 19 wins and Wales fourth on 14 wins. On day two it was nip and tuck between England and Jersey throughout the day, but the England team pulled out all the stops and with a very tight finish the England team proved the victors with a 64-61 game win over Jersey to take home the trophy for England and the title. Glen, Hannah and Carol all played extremely well against some tough opposition, and won eight out of their twelve games, and were very satisfied and proud of their contribution towards the victory. The whole weekend was played in extreme heat, with little shade and comprised nine hours of play a day, so it was quite an exhausting competition. The only other Heart of England player at the championship was Nouri Beladaci, who played with two players from outside the region. Nouri’s team had the highest number of wins for England, winning ten out of their twelve games. Hannah Griffin will be travelling to Belgium this coming weekend, to play for England with the Ladies team so will be wearing an England shirt for the second time in a week.